This week puts me at exactly sixteen weeks till the half marathon. So, after a crappy past three months with running....its time to get serious. I've been searching half marathon training plans for the past couple of months now. I've found several on the internet through pinterest and through the few running books I've picked up over the past few months. 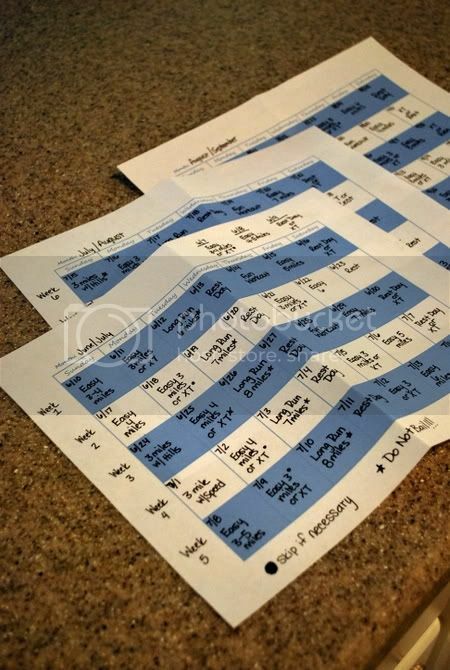 I narrowed it down to two and up until a couple of week ago, I was leaning towards a pretty straight forward simple ten week plan in which you run three days a week and increase your long run mile up a mile each week. Then we went to Florida last week. I would be dying and lying if I told you I didn't look around at those other ladies at the pool and felt a little frumpy in my one piece. It hit me that if I put in a little more work & effort, I could be more confident in my two piece and could then happily hand over my one piece to them who needed it more. Being honest. Which that subject is a whole different post, but ladies....I'm not saying bikinis should be banned, but MODEST IS HOTTEST. So I came home and went with the other training plan that is a 15 week training plan and not only requires three runs a week, but also three days a week of cross training/strength training. The training plan is from the book Training Like a Mother in which I spoke about a couple of weeks ago. I'm not going to completely share the exact plan with you because the authors have an entire website dedicated to running and they do not share their training plans on the website for free. You can only get them through their books, so out of respect for them and their hard work, I won't post it. So please don't ask. I will share with you that one of the biggest reasons I went with it (not only because I know I need to add some strength training in my routine) is because in all their training plans, they give you days to skip a workout if you need to and tell you what workouts you absolutely cannot skip. I really liked that option because with our schedule, some days a workout just cannot be fit in. Along with finding a training plan to stick with, I also broke down and bought some real running shoes. I may have mentioned earlier, but back in January when I first went crazy committed to running the half marathon with my sister, I went to a running store and had my feet scanned. Twenty shoes later, I couldn't bite the bullet (good running shoes do not come cheap) and walked out empty handed. Since it was still early in the game, I think there was still a little part of me that was afraid to spend that kind of money and I not stick with it. Heading into my sixth straight month of running, I was starting to feel it and decided I no longer had a choice. My hips and knees were starting to hurt after almost every run no matter how short or long the run was. This time, I went and didn't blink twice about forking over $110. I even smiled when I did it. Which is hard when your cheap. 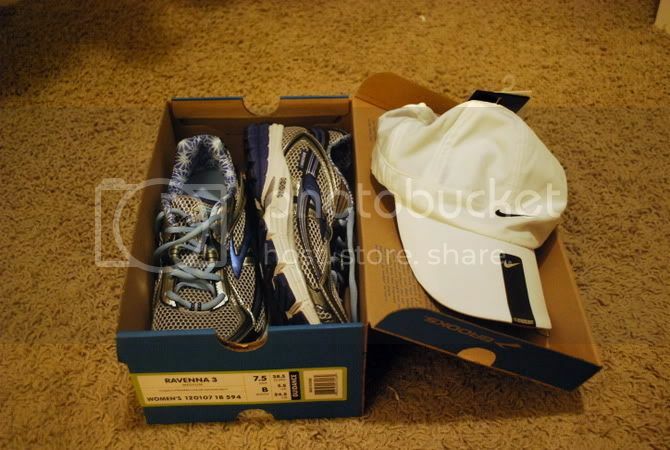 I even splurged and bought a lite weight ball cap for runs. I have learned I cannot wear sunglasses when running. Getting wild and crazy here. I've only had one run in them so far this week and I can tell you its the best $110 I have ever spent. This morning was my first run in a month that I ended it with no a single pain.